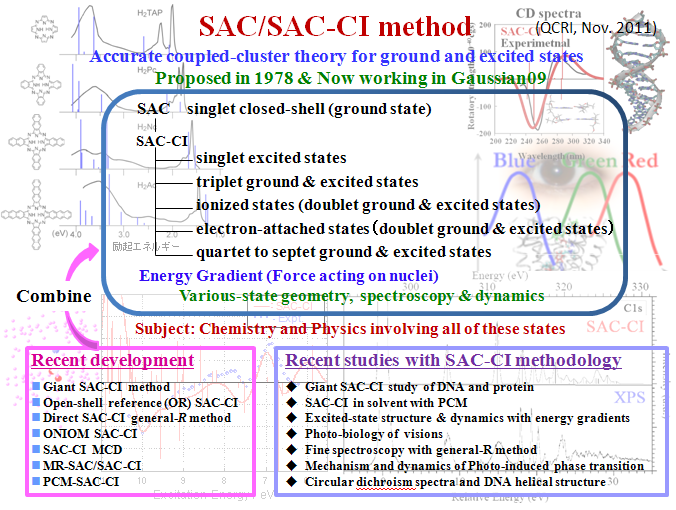 SAC/SAC-CI method is an accurate coupled-cluster theory for ground and excited states of molecules. It was proposed in 1978 by Nakatsuji and Hirao and is now in Gaussian 09. It is used worldwide for photochemical studies. In the Gaussian program, singlet closed-shell state is calculated by the SAC method and with the SAC-CI method we calculate singlet excited states, triplet ground & excited states, ionized states and electron-attached states which are doublet ground & excited states, and even from quartet to septet ground & excited states. Further, we can calculate the forces acting on the nuclei of molecule in each state of all of these spin states. Thus, with the SAC/SAC-CI method we can study chemistry and physics involving all of these different electronic states. Recently we developed Giant SAC-CI, Open-shell reference SAC-CI, Direct SAC-CI general-R, ONIOM SAC-CI, SAC-CI MCD, MR-SAC/SAC-CI, PCM-SAC-CI methods, and they will be combined into Gaussian 09. We recently studied with the SAC-CI methodology the following subjects: Giant SAC-CI study of DNA & proteins, SAC-CI in solvent with PCM, Excited-state structure & dynamics with Energy Gradients, Photo-biology of Visions, Fine spectroscopy with the general-R method, Mechanism & dynamics of Photo-induced Phase Transitions, and Circular dichroism spectra and DNA helical structure. Cluster Expansion of the Wavefunction. Pseudo-Orbital Theory Applied to Spin Correlation, H. Nakatsuji and K. Hirao, Chem. Phys. Lett., 47(3), 569-571 (1977). Cluster Expansion of the Wavefunction. Symmetry-Adapted-Cluster (SAC) Expansion, Its Variational Determination, and Extension of Open-Shell Orbital Theory, H. Nakatsuji and K. Hirao, J. Chem. Phys., 68(5), 2053-2065 (1978). Cluster Expansion of the Wavefunction. Excited States, H. Nakatsuji, Chem. Phys. Lett., 59(2), 362-364 (1978). Cluster Expansion of the Wavefunction. Electron Correlations in Ground and Excited States by SAC (Symmetry-Adapted-Cluster) and SAC-CI Theories, H. Nakatsuji, Chem. Phys. Lett., 67(2,3), 329-333 (1979). Cluster Expansion of the Wavefunction. Calculation of Electron Correlations in Ground and Excited States by SAC and SAC-CI Theories, H. Nakatsuji, Chem. Phys. Lett., 67(2,3), 334-342 (1979). Electronic Structures of Ground, Excited, Ionized, and Anion States Studied by the SAC/SAC-CI Theory, H. Nakatsuji, Acta Chimica Hungarica, Models in Chemistry, 129(5), pp.719-776 (1992). SAC-CI Method: Theoretical Aspects and Some Recent Topics, H. Nakatsuji, in Computational Chemistry – Reviews of Current Trends, Vol. 2, p. 62-124 (1997). Description of Two- and Many-Electron Processes by the SAC-CI Method, H. Nakatsuji, Chem. Phys. Lett., 177(3), 331-337 (1991). SAC-CI Method Applied to High-Spin Multiplicity, H. Nakatsuji and M. Ehara, J. Chem. Phys., 98(9), 7179-7184 (1993). SAC-CI and Full CI Calculations for the Singlet and Triplet Excited States of H2O, H. Nakatsuji, K. Hirao, and Y. Mizukami, Chem. Phys. Lett., 179(5,6), 555-558 (1991). Analytical Energy Gradient of the Ground, Excited, Ionized and Electron-Attached States Calculated by the SAC/SAC-CI Method, T. Nakajima and H. Nakatsuji, Chem. Phys. Lett., 280 (1,2) 79-84 (1997). Analytical Energy Gradients of the Excited, Ionized and Electron-Attached States Calculated by the SAC-CI General-R Method, M. Ishida, K. Toyoda, M. Ehara and H. Nakatsuji, Chem. Phys. Lett., 347, 493-498 (2001). Electronic Excitation Spectra of Furan and Pyrolle: Revisit by the SAC-CI Method, J. Wan, J. Meller, M. Hada, M. Ehara, and H. Nakatsuji, J. Chem. Phys., 113(18), 7853-7866 (2000). Inner-Shell Ionizations and Satellites Studied by the Open-Shell Reference Symmetry-Adapted Cluster/Symmetry-Adapted Cluster Configuration-Interaction Method, Y. Ohtsuka and H. Nakatsuji, J. Chem. Phys. 124, 054110-1-5 (2006).